Lunagirl Moonbeams by Lunagirl Vintage Images: Did you know...... about Lunagirl's gift shop? Did you know...... about Lunagirl's gift shop? 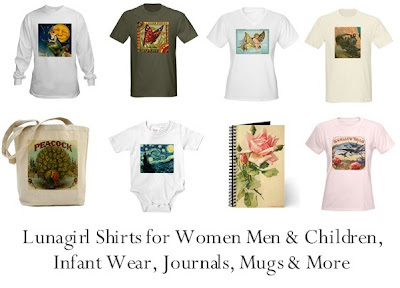 You can buy Lunagirl shirts, sweatshirts, other clothing, tote bags, baby items, mugs, journals and more by visiting our Lunagirl Shop. Featuring a variety of Victorian Edwardian and vintage images: Halloween and Christmas pictures, antique advertising labels, women, men, fairies and angels, flowers, animals and birds, antique trains and planes, fantasy and steampunk, even beautiful paintings by Van Gogh, Bouguereau and Waterhouse. And it's at Cafepress, which has all kinds of discount offers and specials this time of year (and throughout the year, really). Last but not least, you'll also find Lunagirl Calendars for 2012!